Kris Sirchio plays to win: he was a sweeper on the Duke University men’s soccer team that won a national championship in 1986. Sirchio, 48, is bringing his competitive spirit to a new role, as chief executive officer of Rochester-based North American Breweries. NAB’s holdings include Buffalo-based Labatt USA, which imports, markets and distributes Labatt products in the United States. Labatt USA has about 55 employees in Buffalo – among 1,100 people that NAB employs – and sponsors an annual pond hockey tournament here. NAB also makes and sells Genesee beers, among other products. Sirchio was born in New Jersey and later moved with his family to Michigan, where the Labatt brand was familiar. Most recently, he was an executive with Brown-Forman, a wine and spirits company whose product lineup includes Jack Daniel’s whiskey. Sirchio will be based in Rochester, and he is getting familiar with the markets served by NAB, which is owned by FIFCO, a Costa Rican company. Matt Glynn: What are your impressions of Labatt USA? Kris Sirchio: Labatt is an incredible brand. I grew up in Michigan and Genesee County (Mich.) and Labatt was a brand that I knew growing up. And I love the marketing and the advertising that the team has been doing here. I love the product innovation. Blue Royale is a great new innovation to the brand. Some of the marketing work that we’re doing that goes down to the community level, even with pond hockey, I think is tremendous. 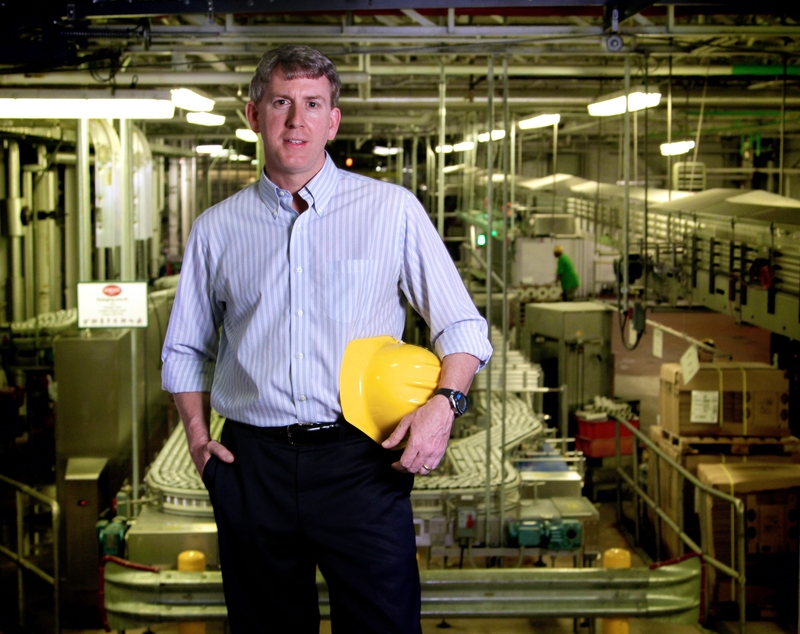 MG: How successful is Labatt in Western New York? KS: My understanding is that in Buffalo, that is one of our No. 1 markets, Labatt is very, very strong (in Buffalo). MG: U.S. beer sales in the past few years have been relatively flat, and the growth is forecast to be less than stellar in the near future. How does NAB compete in that kind of sales environment? KS: It’s a tough market and the weather hasn’t helped anybody recently, of course. But I think our size is an advantage, and there’s so much to that. We’re still small enough and big enough where we can make a difference with our scale. And I think what’s really quite special about our portfolio is we’ve got phenomenal quality brands that have proven they can grow recently. And we have the history and heritage with our relationships and our partners in the three-tier system, with retailers, wholesalers and distributors. It’s much more of a family relationship, and I think that’s very unique. MG: What got you interested in taking this job? KS: For me, there’s just a tremendous opportunity for growth. There are three components: we’ve obviously got great brands, a great portfolio that covers the entire market of beer in the industry, phenomenal people and facilities and assets. But there’s just a tremendous and amazing sense of pride around here about the business and the brands and the community. And the third is really our parent company, FIFCO, which is an amazing company with a deep-rooted history in beer, over 100 years in winning and building beer brands. And they have a long-term investment philosophy that is very unique. MG: Will NAB continue to produce Labatt in Canada for sale in the United States? MG: What is Labatt’s potential to grow into new U.S. markets? KS: You really need to do that very smartly with your partners, obviously, but you need to think about city by city, town by town, state by state, bar by bar. You win in this business in the on-premise and in the retail. … I think Labatt has tremendous assets to build from here. You’ve just got to be careful that you do it step by step and not think you can go national all in one day, which is these days very challenging. MG: What experiences from Brown-Forman can you apply to your new job? KS: The spirits industry and the beer industry have the same three-tier system, so the dynamics of working and building relationships with partners – distributors, wholesalers and retailers, the on-premise environments – are very similar. … The other thing I would say is, our portfolio of our brands matches up tremendously well with the portfolio of brands where I was. MG: What role does Labatt USA’s Buffalo office play in your plans? KS: They’re outstanding. We’ve got great folks and great brand leaders, great innovation. And I expect them to continue doing what they’re doing, which is leading the way and creating exciting campaigns that get the three-tier system and consumers excited, absolutely. MG: What was it like being on the Duke championship soccer team? KS: I had just an amazing set of teammates. We had 11 seniors. ... When you get great players together, you can do amazing things when you get the right team dynamics. And I just so strongly believe in that in everything we do in my professional life as well. It was a great experience. MG: Who will win the World Cup this year?